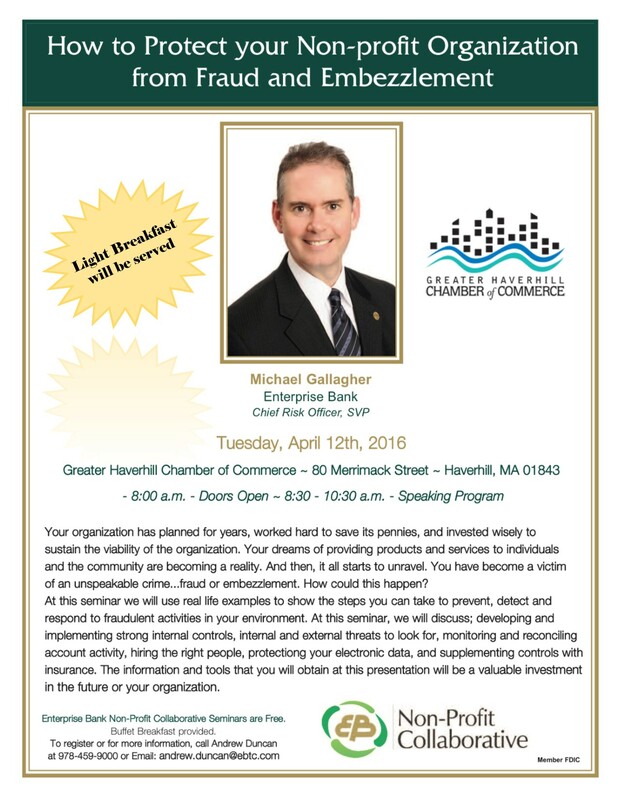 The Greater Haverhill Chamber of Commerce, in partnership with Enterprise Bank Non-Profit Collaborative, will deliver an informative and hard-hitting seminar for non-profits entities, their executives and those serving on boards of directors. Every non-profit entity works tirelessly to plan and build the organization, save pennies for needed improvements or additions, and invests wisely to sustain the viability of the group. Just like that – one act could be the undoing of years of planning and organizing. Don’t let that happen to your non-profit! The workshop, “How to Protect your Non-Profit Organization from Fraud & Embezzlement,” will be presented by Michael Gallagher, Chief Risk Officer, SVP with Enterprise Bank, on Tuesday , April 12, 2016 at the Chamber offices. The morning will include a light breakfast, with registration beginning at 8:00 AM. Gallagher will cover: real-life examples to show steps you can take to prevent, detect and respond to fraudulent activities in your environment. The information and tools acquired in this session will be a valuable investment in the future of your organization. Discussion will include: developing and implementing strong internal controls; internal and external threats to be on the lookout for; monitoring and reconciling account activity; hiring the right people; protecting your electronic data; and supplementing controls with insurance. The presentation begins at 8:30 AM and will conclude at 10:30 AM. As part of the non-profit collaborative, this event is FREE for anyone who would like to attend. Seating is limited, and RSVP is required. Seats may be reserved by contacting Beverly Donovan at the Chamber office at 978-373-5663 or Beverly@haverhillchamber.com. For information about other Chamber events please email info@haverhillchamber.com.